You only need a few ingredients to make a homemade air freshener, and that’s the great thing about it. You’ll save money making your own, and you won’t be filling your home’s air with irritants. As research is starting to show, commercial cleaning products and air fresheners significantly contribute to indoor air pollution. This, in turn, is associated with a variety of unpleasant health conditions. That’s why it’s so important to know what’s in your cleaning products and to take steps to maintain healthy indoor air. Here are three homemade air fresheners to mix and match around your home. If you want, vary the scent based on the season. In the winter, try cinnamon, clove, ginger, and orange oils. In the spring, make a homemade air freshener featuring lighter scents like lavender with lemon, or grapefruit and rose. The point is: experiment with fragrances and discover what smells suit you. That’s half the fun! 1. Combine and use as a spray, or in reed or electric diffuser. 2. Store unused mixture in a cool, dark place. The use of vinegar in this homemade air freshener recipe also eliminates odors while adding fragrance, too. It does a brilliant job of deodorizing garbage cans and diaper pails. 1. Combine all ingredients in a small pan on the stove. 2. Bring to a boil then turn off heat and allow to reach room temperature. 3. Strain and store unused portion in a cool, dark place. While lemon juice does neutralize baking soda, that’s only relevant when we’re trying to use the baking soda for cleaning. Here, the reaction doesn’t destroy baking soda’s odor-killing power. The combination leaves a nice, clean fragrance. 1. Combine the water and baking soda in a deep bowl. Stir until the baking soda fully dissolves. 2. Slowly add the lemon juice — it will fizz, but that’s why you’re using a deep bowl. 3. Once fizzing stops, transfer the mixture to a bottle for use. 4. Store unused portion in a cool, dark place. As a room spray: To use any of these, add them to a spray bottle and mist the air. Do not use around delicate fabrics (i.e., silk) or leather where essential oils may leave spots. Shake well before use. In a heated diffuser: Fill an electric fragrance diffuser with 1/4 to 1/2 cup of the liquid and allow the heat to spread the aroma through your home. Refill as needed. Do NOT use Homemade Air Freshener #1 with tea light diffusers as the vodka is highly flammable! 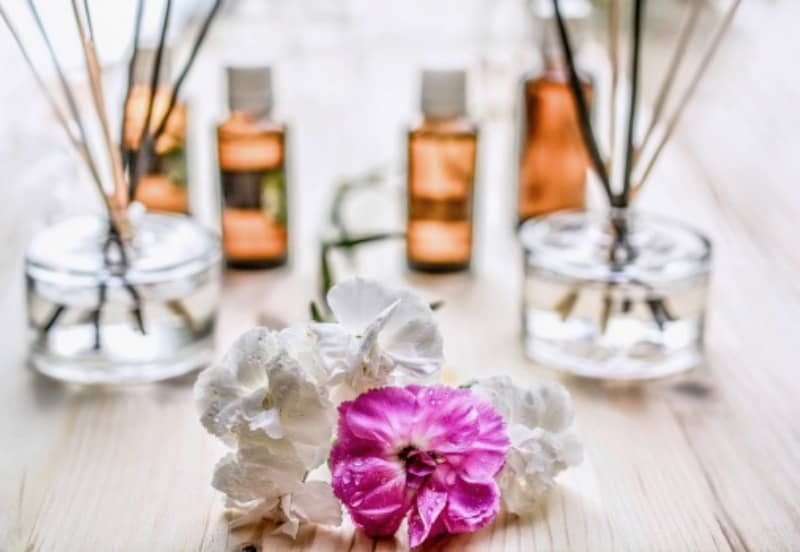 In a reed diffuser: Fill a bottle or jar 3/4 of the way with your preferred homemade air freshener. Add rattan reeds and wait 2 hours. Turn the reeds end-to-end and insert the dry end into the container. Rotate the reeds daily and refill as needed. Hey Katie! I love your blog!! I follow so much of your advice! 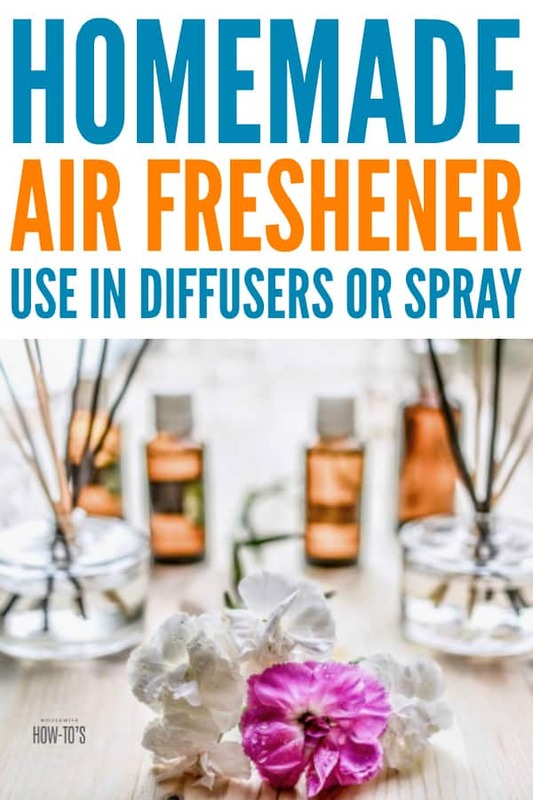 My question is, when I make your homemade air freshener #3 it has no smell! Am I doing something wrong? You aren’t smelling the lemon in the Lemony Fresh Air Freshener recipe? Oh no! You’re welcome to add essential oils to it if you’d like additional fragrance. For air freshener #1, could you use rubbing alcohol instead of vodka? Thanks! How much of gelatine is in one packet?im asking for the recipe of air freshner gels. I cant get gelatines in packets here so…i would like to approximate.Like in tablespoons or cups? I assume you’re referring to my recipe for homemade air freshener gel? There are 7.2 grams of gelatine in a packet, so roughly 1/2 tablespoon. I decided to get serious about being a stay at home mom this year and found your site. I am 41 and have four children, three of which are still at home. I have always been a clean fanatic but I am learning so much from your site. It’s amazing how many places you forget to clean. Thank you so much for taking the time to put your to do list up for me to share. It is like you are doing half my work for me. Thank you for the kind words, Liz! Being a full-time SAHM is tough work, and it’s so difficult to keep track of all the little things we’re expected to do on top of the obvious care-taking, cooking and cleaning. Kudos to you for the time and effort you’re putting into it! Loving your blog! Your lists are so helpful and your homemade cleaning supplies make me feel so much better when it comes to family and pet exposure. Question… When you make the air freshener #1, do you ever double or even triple the recipe? It doesn’t seem like it would last too long in such a small amount. Thanks so much! Very cool! I can’t wait to try these! I’m a new subscriber! YAY! I like #2 in the fall and winter; the cloves and vanilla give the house such a warm, spicy smell. LOL! Red wine would definitely *not* have the effect you’re looking for. On the other hand, if you drink enough of it you won’t care what the house smells like.